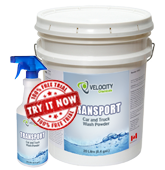 TRANSPORT is a high foaming product for general purpose vehicle cleaning and degreasing. It is used to remove road film and light oil/grease from mobile equipment or vehicles in heavy equipment shops, truck and car washes, railroads and mines. Safe to use on all metals when used at recommended concentrations. Light Duty Washing – for pick up trucks and passenger vehicles: Use a 3-5% solution. Heavy Duty Washing – for off road vehicles and heavy equipment: Use a 5-10% solution.